#WildlifeWednesday Cats Are Coming Out of Hiding! 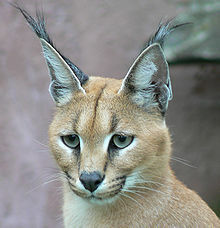 Arabian Caracal & Taiwanese Leopard Reappear! Happy Wildlife Wednesday! In less than 2 weeks - 2 awesome stories of the “reappearance” of the Arabian Caracal & the Taiwanese Leopard. Click here for the link to the amazing the first sighting of the Arabian Caracal in 35 years in Al Ain, United Arab Emirates. And, click here to read about the discovery of the believed to be extinct Taiwanese Leopard, last seen in 1983. Welcome back you Majestic Cats!! !